Richard Nott Antrim, born in Peru, Indiana, on 17 December 1907, entered the Naval Academy in 1927 and graduated on 4 June 1931. He served briefly in the 11th Naval District before reporting to NEW YORK (BB 34) as fire control officer. Detached from that battleship in April 1932, he received flight instruction at the Naval Air Station (NAS), Pensacola, Fla., before serving consecutive tours of sea duty in SALINAS (AO 9), NITRO (AE 2), and TRENTON (CL 11). Subsequently ordered to the Bethlehem Steel Corp., Quincy Mass., Antrim assisted in fitting out PORTLAND (CA 33) and after her commissioning, served as a division officer in that heavy cruiser until the spring of 1936. After that time, he became assistant first lieutenant in CROWNINSHIELD (DD 134) before undergoing instruction in lighter-than-air (LTA) flight at NAS Lakehurst, N.J. Antrim subsequently received his naval aviator (LTA) designation, qualified for duty as an airship, kite, or free-balloon pilot. In the spring of 1938, Antrim arrived on the Asiatic Station and served as executive officer of BITTERN (AM 36) before joining POPE (DD 225) in December 1939, as her executive officer. The outbreak of war in the Pacific in December 1941 found Antrim still serving in that capacity. During her brief wartime career, POPE played a significant part in two major engagements fouht by the venerable Asiatic Fleet destroyers-the Battle of Makassar Strait and the Battle of Badoeng Strait, as well as in the last act following the Battle of the Java Sea. In the former, POPE delivered close-range attacks that momentarily helped to delay the Japanese landings at Balikpapan. During the action, Lt. Antrim cooly selected targets for his guns and torpedoes, placing his shots so accurately in the midst of a large Japanese convoy" and thus inflicting damage to several enemy ships. After the Battle of Badoeng Strait, POPE's commanding officer, Comdr. Welford C. Blinn, reported that his executive officer was "highly deserving of commendation for the meritorious performance of his several duties before and throughout the action." Citing Antrim as a "ready assistant in navigation fire control, and torpedo fire," Blinn recommended him not only for a destroyer command but for a "decoration deemed appropriate." Antrim later received a Navy Cross for this service. The Battle of the Java Sea (27 to 28 February 1942) ended all Allied hope of stemming the Japanese onslaught. In the wake of that action, the smashed Allied fleet attempted to escape the cordon of Japanese warships rapidly tightening the noose around Java. Among the small groups was one composed of the British heavy cruiser HMS EXETER, the destroyer HMS ENCOUNTER, and POPE. The ships slipped out of Surabaya, Java, on the evening of 28 February, but were spotted the next day by Japanese aircraft. A surface force of cruisers and destroyers located the fleeing trio, and a fierce action ensued, with EXETER and ENCOUNTER after having put up a stiff fight, going down under a deluge of Japanese shells. POPE, however, fought on, managing to make a temporary haven in a passing rain squall. Unfortunately, the destroyer-one of those Asiatic Fleet flushdeckers "old enouh to vote"-could not elude her pursuers. Ultimately, damaged by Japanese bombs, from aircraft summoned from the carrier RYUJO, and by shells from the Japanese force, POPE began to sink, but not before all but one of her men had reached safety in life rafts and the destroyer's sole motor whaleboat. Antrim, wounded in the action, helped to gather the life rafts around the boat to facilitate the disribution of what meager supplies were available to the men. His devotion to duty during the ordeal inspired and sustained his shipmates' morale. For three days and nights, POPE's survivors doggedly stuck together as a group until picked up by a Japanese warship and transferred to Japanese Army authorities at Makassar, in the Celebes. There, Antrim performed an unforgettable act of personal bravery. During the early part of his imprisonment at Makassar in April 1942, he saw a Japanese guard brutally beating a fellow prisoner of war (POW) and boldly intervened, attempting to quiet and reason with the guard, as others, and some 2,000 POW's closed in about the scene. However, the Japanese ignored Antrim's entreaties and continued beating the prisoner unmercifully. After receiving some 15 blows with a hawser and the kicks of three other guards, the victim was almost insensible. At that instant, Antrim stepped forward. The expressions of the Japanese changed to incredulity as the lieutenant volunteered to take the remainder of the battered man's punishment. This action threw his captors off balance and drew a roar of acclaim from the Allied POW's gathered around. Antrim's stand, while saving the life of the other man also saved his own and won new respect for the American officers and men. Later, his leadership in serving as a spokesman for his fellow POW's earned them an improvement in camp living conditions. For his conspicuous act of valor at Makassar in the spring of 1942, Antrim later received the Medal of Honor. Subsequently when the Japanese forced Antrim to take charge of a labor detail assigned the task of constructing slit trenches for protection during air raids, he carefully rearranged the construction work plans approved by the Japanese and gained their approval of his own ideas. Under the eyes of their captors, the POW's due the slit trenches all right, but in a curious pattern recognizable from the air as a giant "U.S." which clearly and craftly identified the occupants of the trenches. This audacious action possibly saved hundreds of prisoners of war from mistaken bombings by Allied planes. Antrim carried out the plan in spite of the fact that discovery of his trick would have resulted in instant beheading! For that alteration of construction work Antrim received a Bronze Star. Ultimately liberated after the war in the Far East ended in August 1945, Antrim returned to the United States and enjoyed rehabilitation leave before attending the Repatriated POW Refresher Course at the Washington Navy Yard, Washington, D.C. in May 1946. He then brushed up on his pilot training at NAS Lakehurst and later completed a course at the Naval War College. The valiant officer-who had been listed as missing since the sinking of POPE in March 1942-received the Medal of Honor and Bronze Star from President Harry S. Truman in ceremonies at the White House on 30 January 1947. 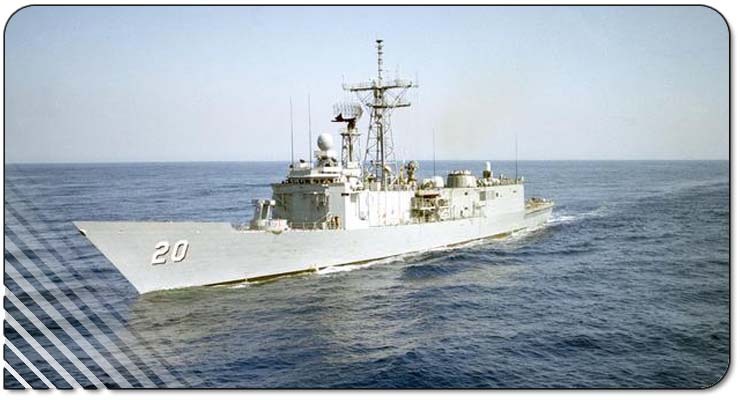 Later, following a brief stint at the Fleet Sonar School, San Diego, Calif. in June and July 1947, Antrim went to sea in command of the destroyer TURNER (DD 834). He next underwent further instruction at NAS, Lakehurst, before assuming the duties of Assistant for Lighter-than-Air Planning and Programs Office of the Chief of Naval Operations (CNO), Washington, D.C. in December 1948. Following further Washington duty-with the Policy Advisory Staff, Department of State, and the Psychological trategy Board-Antrim commanded the attack transport MONTROSE (APA 212) before returning to the capital for a brief tour of duty as Head, Amphibious Warfare Matters Section, Office of the CNO, prior to his retirement on 1 April 1954. He was advanced to rear admiral on the retired list on the basis of his combat awards. Rear Admiral Antrim died on 7 March 1969 in Mountain Home, Arkansas. He is survived by his wife Mary Jean Packard Antrim, the ship's sponsor, and their three children. The Shield: On the shield, the dark blue and gold are traditionally associated with the Navy and represent the sea and excellence. The light blue and downward pointing star refer to the Medal of Honor awarded to Real Admiral Antrim for heroic actions while in a Japanese POW camp at Makassar, Celebes and Java. The anchor symbolizes his naval career and represents his dedication to service. The crosslets are a personal device from the Antrim family crest. The cross throughout the shield is an allusion to the Navy Cross awarded Admiral Antrim for action in the battle of Java Sea in the Dutch East Indies. 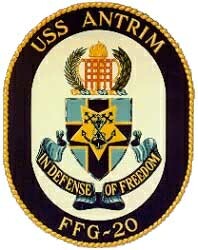 Beneath the shield is the ship's motto "In Defense of Freedom", which provides a reference to both Admiral Antrim's life of dedication and the mission of the ship which bears his name. The Crest: The wreath is for outstanding gallantry and achievement in which the palm denotes victory, and the laurel, honor. The torch symbolizing leadership and bravery is contained behind the portullis representing the period of imprisonment as a prisoner of war.